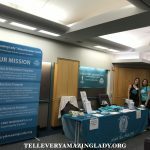 Tell Every Amazing Lady® was featured at the Harvard Global Women’s Empowerment 3rd Annual Expo on September 29, 2018 in Boston. T.E.A.L.® spoke with Harvard students and alumni about ovarian cancer and in an awareness campaign to educate the Harvard community. Showcased among other exceptional Global Women’s programs, T.E.A.L.® advised women to listen to their bodies and provided educational materials. Thank you to the Harvard Global Women’s Empowerment team!